Republican congressmen from Texas facing tough re-election fights are betting on very different strategies to win over key voters. WASHINGTON — As the U.S. House of Representatives again finds itself hamstrung on immigration reform, vulnerable Republican incumbents are caught between a rock and a hard place: Their Democratic opponents will criticize their inaction if they steer clear of the issue — or their support for conservative immigration measures slated for a vote next week. Texas Republicans facing tough re-election fights are no exception, and they're betting on very different strategies to win over key voters. U.S. Rep. Will Hurd, for example — whose swing district stretches across the Texas-Mexico border — is allying himself with moderate Republicans and Democrats. U.S. Rep. Pete Sessions of Dallas is backing immigration hardliners on the far right. And U.S. Rep. John Culberson of Houston is holding his cards closer to his vest; his campaign says his priority is increasing border security. Immigration “is one of the few issues that can really change an election,” Republican strategist Brendan Steinhauser said. "You are faced with this hard choice where Republicans are very much in favor of what the Trump administration is doing on immigration, and Democrats are kind of the opposite. So you’re going to irritate one side or the other." That's certainly the case in Texas, where immigrants comprise roughly 17 percent of the state's population and Texans watch immigration policy play out firsthand along the border. Democrats and many immigrants advocate for a pathway to citizenship for recipients of Deferred Action for Childhood Arrivals, an Obama-era program that provided legal protections to undocumented youth. A recent estimate by the Migration Policy Institute, a think tank focused on immigration, puts the number of DACA recipients in Texas at around 111,000. On the opposite end of the spectrum, far-right Republicans oppose such a pathway, instead calling for ramping up border security and deportation efforts. Hurd, Sessions and Culberson are all considered vulnerable in November; they represent districts Hillary Clinton won in 2016. Hurd's district, which spreads from El Paso to San Antonio, flips parties every few years, and a popular former Air Force intelligence officer, Gina Ortiz Jones, is making a big play for the seat. Culberson is up against Democratic nominee Lizzie Pannill Fletcher, and the Cook Political Report categorizes both his and Sessions’ districts — where attorney Colin Allred is vying to unseat the 11-term congressman — toss-ups. Rice University political scientist Mark Jones chalked up the incumbents' varying political strategies on immigration to demographics. Hurd, who led a recent "discharge petition" that aimed to force a vote on bipartisan immigration bills, represents a majority-Hispanic district that would be home to much of the border wall conservative Republicans want to fund — and will house the first tent city for immigrant children separated from their families as a result of the Trump administration’s “zero-tolerance” policy. It's a district where Trump is very unpopular, so it pays for Hurd to distance himself from the president and his allies. In contrast to Hurd’s district, Hispanics make up just 14 percent of the estimated voting age population in Sessions’ district and 19 percent in Culberson’s district. Though those districts are becoming more diverse, Sessions and Culberson remain focused on courting the mostly white, reliable Republican voters who make up their base, Jones said. “The people they have to worry about are moderate, Anglo Republicans. And a moderate, Anglo Republican isn’t going to vote against John Culberson or Pete Sessions because they failed to sign an immigration discharge petition,” he said. The discharge petition — a rare procedural move to bypass the normal order of business on Capitol Hill — was seen as a rebellion against the Republican establishment, since such attempts to buck House leadership are normally led by the minority party. Signed by all House Democrats and a number of moderate Republicans, it fell just shy of garnering the 218 signatures it needed Tuesday night. Sessions, who chairs the House Rules Committee, criticized Hurd’s maneuver in an interview this week. In the wake of the discharge petition’s failure, Congress will vote on two Republican-sponsored bills next week. 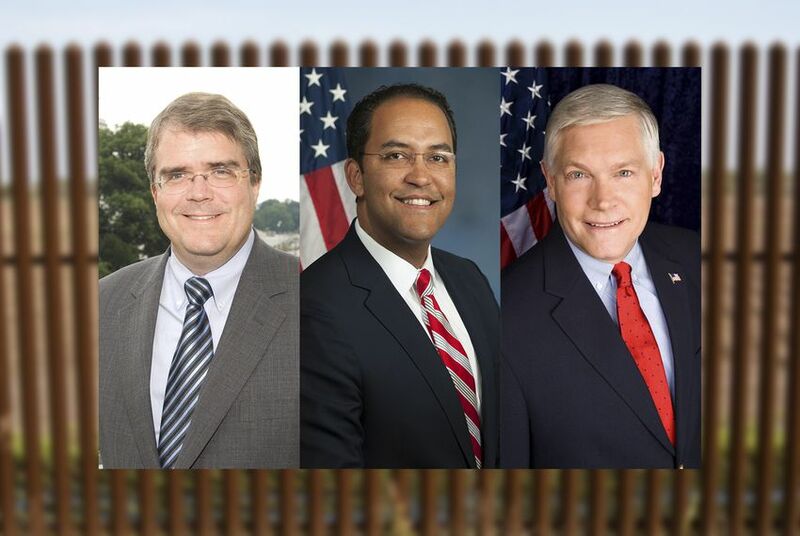 The more conservative bill—put forth by U.S. Rep. Michael McCaul, R-Austin, and U.S. Rep. Bob Goodlatte of Virginia — would sharply curtail legal immigration, fund a border wall and require employers to use an electronic system to verify that their employees are legal residents. It does not allow DACA recipients to eventually become citizens. The other, a “compromise” bill spearheaded by House Speaker Paul Ryan, provides a pathway to citizenship for certain qualifying DACA recipients, though it retains many of the elements of the more conservative bill — including funding for a border wall and provisions to cut back on legal immigration. Sessions said he supports the more conservative option. Culberson campaign spokeswoman Catherine Kelly wrote in a statement that border security is Culberson's priority. "Congressman Culberson believes we need to secure the border to stem the flow of illegal immigration – especially dangerous criminals who are negatively impacting our communities," she wrote. "The congressman will continue to fight for increased funding to law enforcement officers on the border and ensure they have the resources to keep our country safe and secure." Ideological convictions aside, Jones and Steinhauser said, it makes political sense given the demographics of the representatives' districts. Regardless, neither bill has much chance of passing, since Republicans remain split on the two pieces of legislation. If both bills come up short, it will only help Democratic candidates, who point to Congress’ inability to pass legislation reforming immigration. In a statement provided by her campaign Friday, Fletcher, Culberson's opponent, emphasized the gridlock that has marked the Republican-controlled body. “There is no doubt that we need to fix our immigration system, and the residents in this district have told me how concerned they are about doing so," she said. "It is complex and presents difficult challenges, but the House’s utter failure to even try is unacceptable."